Whilst I was in Canberra for Cancon 2009, I caught up with Jeffro and Steve. Steve, of course, is an aficionado of the cheeseburger like his dear Dad so we did lunch. We went to the Hog’s Breath Cafe in Civic in Canberra. Hog’s Breath was chosen as I hadn’t managed to eat at a Hog’s Breath yet and it therefore seemed too good an opportunity to miss. I looked at the cheeseburger on the menu but opted instead for the Boss Hog Burger. 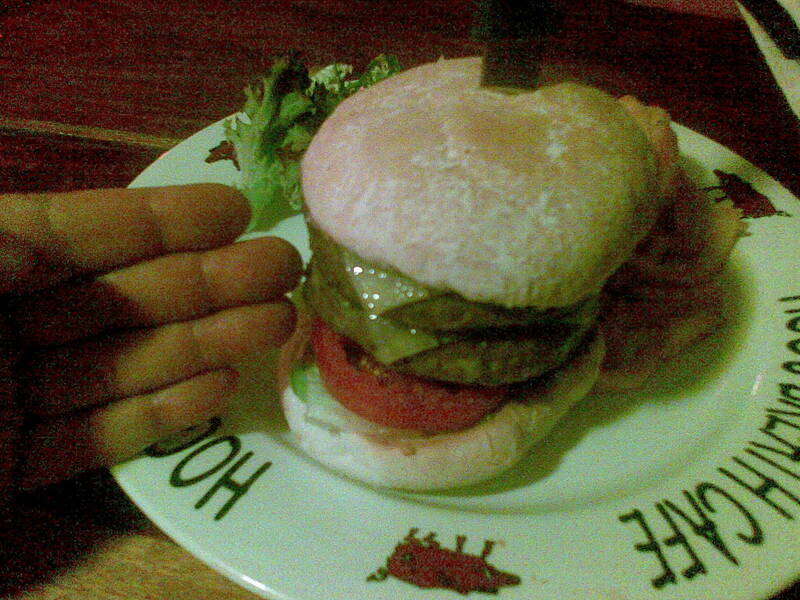 That’s the giant burger you can see next to my hand. Two beef patties each weighing about the same as a small cow cooked on a char grill and served inside an Aussie style bread roll. Add tomato, onion, beetroot, lettuce and a couple of slices of cheddar cheese and a most wonderful burger was created.